When it comes to moving a car, you’ll face many decisions. One of the biggest choices is how you go about moving the car. Should you rent a trailer or dully from U Haul, or from Penske to tow it yourself, or should you hire a car shipping company to handle the whole job? In this post, we’ll try to help you choose the best way to ship a car. What size are U Haul car trailers? Most companies rent out trailers, trucks and vans ranging from 10 feet to 26 feet. Provided you hire a big enough truck or trailer, that should fit your car. It’s an easy process and pricing is good too. One of the main benefits of hiring a trailer is that you can move your car and or household goods out of state and simply return the vehicle or trailer to your nearest UHaul locations or U-Haul branch, provided it is one of the vehicles that are approved for drop-off anywhere. Some vehicles are for local use, so it is crucial to check and book in advance to ensure availability for these types of utility trailers. How much is it to rent a Penske car trailer or a car dolly from uhaul? If you have the experience and the time, renting a car dolly or trailer from U-Haul is cheap and convenient. The Penske truck rental is also good when you have that moving labor force like packing supplies into the trailer and towing. They have trucks in a variety of sizes, starting with cargo vans and pickup trucks from $19.99 to $39.95 a day, but bear in mind that that is not necessarily the bottom line. For round trips, you will pay $.99 per mile when you hire a moving truck. One way trips come with free unlimited mileage, so it is a flat-rate moving rate. They also have two insurance options, one being basic insurance and the other has added protection to cover supplemental liability in the event of third-party lawsuits. Can you transport a car in a U-Haul car trailer? Budget car trailer rental is also a cost-effective method for you to ship your car, but they do highly recommend that you only hire a trailer if you have a four-wheel or all-wheel drive truck. If you don’t have a 4WD or AWD vehicle, you can borrow one from someone. Most car rental companies do not permit any hitching or towing of any kind. Yes, you can transport a car in a U-Haul trailer or UHaul trucks if you have experience in pulling a trailer. That means that you can make turns that will clear enough room for the car and the trailer and that you know how much room you will need in order to slow down, since you’re carrying extra weight. Don’t try to tow a car unless you have had plenty of experience pulling cars in bad weather conditions (rain, wind, snow). You have to be adept at responding to emergency situations and road hazards if you were to put your car in a U-Haul and tow it across state lines. The uhaul auto transport it might be good for towing equipment for your personal rentals, but you are the one that load your trailer and drive vehicle. No matter how experienced you are at negotiating the trickiest of roads, angling the vehicles or backing up with perfection, anything can happen. When you’re towing a vehicle, you are the only responsible party. Why take that car trailer rental risk of when you can rather ship a car into enclosed cargo trailers. Moreso if you have no experience at all. 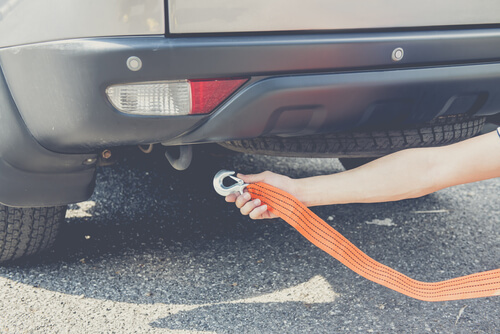 Towing a car is risky for someone with plenty of experience, let alone someone who doesn’t know that the hitch sometimes works similarly to a hinge. What will you do if you are reversing, and the trailer moves in the wrong direction? Save yourself the hassle and make use of a company that knows how to ship a car instead. When using a tow dolly, be sure to follow U-Haul’s tow dolly user instructions to make sure you stay safe. In most cases, it is simply safer and more cost-effective to use an auto shipping company instead of car trailer rental to help you ship a car. Using an auto transporter means that your car is in safe hands, as it is transported by someone who is qualified, licensed and bonded to do just that. It is not just moving boxes, you need to use the towing devices to place your vehicle onto the rental truck. You’re not responsible, which means that you can rest assured as you wait for your car to be delivered to your chosen destination. 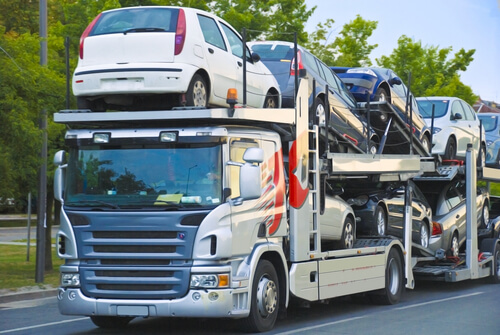 Whether you ship a car by towing it yourself or by hiring a car hauler, it is important to carefully prepare your car for shipping and to research a company’s reviews online before making the decision. 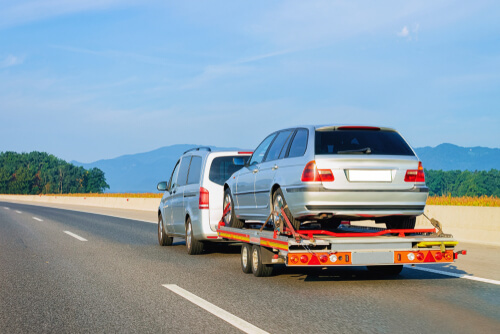 Getting your towed vehicle to any rental locations with a trailer hitch might not be the best option. Always transport your automobile with a car carrier, possibly an enclosed cargo trailers, utility trailers or choose moving truck that will lift the front wheels only for short destinations. Trailer rental for car transport might be a good option to move your vehicle, but this type of shipping might be dangerous for your precious cargo. Especially if you are inexperienced with car trailers. Would you like a free quote on car shipping? Ship your car with Nationwide Auto Transportation and know that it will arrive safely.